Drive from Arusha to Mt Kilimanjaro National Park, passing by the village of Machame to meet your climb crew at the Machame Gate. As you begin the gentle ascent, the trail winds though the verdant afromontane rainforest that beards Kilimanjaro’s lower slopes. Moss and tattered lichen dangles from tall branches, tree ferns rest in soft cradles, and begonias, busy lizzie impatiens, and violas bloom year-round in multiple colors on the forest floor. Many species of birds – as well as colobus monkeys, blue monkeys and other creatures of the forest – can be seen and heard. The first camp is set amongst giant heather at Machame Camp. Leaving the glades of the rainforest behind, you continue on an ascending path along a steep ridge onto heather-clad moorland. This is known as the heath zone and, as the vegetation becomes more sparse, attractive helichrysum and lobelia are the only plants dominating the harsh mountain landscape. Various geological features can be observed, ranging from lava tubes to glacial valleys. A picnic lunch is taken on trail today. Continue up a rocky ridge onto the Shira Plateau. By now you can see the Western Breach with its stunning glaciers, and after a short hike you reach the Shira Camp. Your tent tonight can definitely be described as “a room with a view” looking out towards the snow-dusted Kibo peaks. Overnight Shira Camp. Today is a walk-high sleep-low day. You ascend into alpine desert towards the main peak of Kibo, where the western glaciers become clearly visible. Lunch is taken as a picnic en route. If you feel very strong there is an optional ascent of the 300-foot-tall Lava Tower before descending to Barranco Camp in the afternoon, passing through the strange yet beautiful ‘Garden of the Senecios’ (giant groundsel), which also features many giant lobelias. The Barranco Valley is one of the prettiest areas of the entire trail. This is long day but the next time you head to this altitude is in two days’ time, making this a great acclimatization day! Overnight at Barranco Camp. Depart just before midnight for the final summit bid. Patience and persistence is the name of game to reach the summit, and this is the coldest, windiest section of your adventure. Most likely by dawn, as the first rays of light start to appear across the Tanzanian landscape, you arrive near the rim at Stella Point, at an altitude of 18,652ft. Here, you are rewarded with the most glorious sunrise you are ever likely to see, appearing over Mawenzi Peak. Ascending via Stella Point affords a relatively short final section to Uhuru Peak, the Roof of Africa! Take as many pictures as you can! After a short celebration at the summit, begin the ebullient trek down. Go slowly and enjoy the wonderful rainforest scenery as you head towards Mweka Camp, arriving before dusk. With every step the air has more and more oxygen so although your legs will be jelly your heart will be light. Overnight Mweka Camp. Follow the trail over a rolling, rocky terrain directly to your next camp. With such surroundings, it’s easy to stay motivated and inspired. Sleeping at a lower altitude tonight will further help you acclimatize. On a clear night, you can see the lights of Moshi town! Enjoy the extraordinary views as you pass massive volcanic formations scattered throughout the fields of scree. 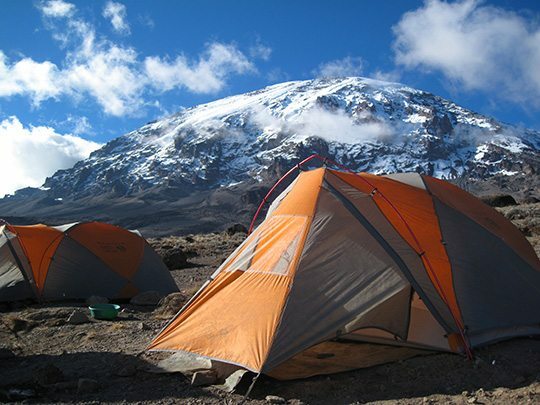 Camp in this lunar landscape where you may see the hanging glaciers that drape Kilimanjaro’s summit cone. Begin your ascent after a nourishing breakfast at camp. You’ll trek over a varied terrain of switchbacks, loose scree, and snow-packed trails.